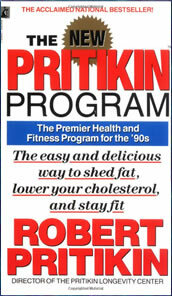 The Pritikin program was originally published as a diet and fitness plan (around 1979). The book was authored by Nathan Pritikin. Nathan founded the Pritikin Longevity Center in California. Robert Pritikin carried on the work of his father, publishing the book The Pritikin Weight Loss Breakthrough – advocating a ratio of about 10% fats. Since Pritikin has published an updated version in 2007 called The New Pritikin Program. The Pritikin Center advocate a very low fat diet that is high in carbohydrates. A traditional low fat diet is comprised of 20-30% fat. Very low fat diets go much lower than this. Pritikin doesn’t have a distinct diet plan, but something called the Pritikin Calorie Density Solution. This involves looking at the combined calorie content of a whole meal. They aim to combine lower calorie content foods such as Pasta, Potatoes, Rice, Fruit, Vegetables, Seafood, and Poultry – with a small amount of fats (which they refer to as “forbidden”). They make the interesting claim “…eat as much as you want… and you’ll still lose weight safely”. Pritikin Diet – Is it Good? Some of the claims made seem simply as sales speak. While it is good to reduce the fat in your diet, it is also easy to gain weight by eating too much processed or refined carbohydrates. Some diets are only appropriate for certain people. If you are carb sensitive, this diet will not do you any favors, but some of the principles are sound. Recent research has further debunked “lowfat” type diets and even supports the need for healthy fats in the diet. In general healthy fats should make up at least 25% of your total calorie intake. The New Pritikin Program retails for $20.95. There is also an online version of the Pritikin Diet that costs $95 – $395 a year depending on the membership level chosen. Programs located at the Pritikin Longevity Center cost between $4000-$5,500 a week depending on options chosen. Eating a very lowfat diet and getting regular exercise, with the carbs coming from Real Food ™ is healthier than any of the weird diets out there. You know the guy who wrong South Beach Diet died of heart disease, right? My mom tried it. It didn’t work, all it did was make her sick. “Pritikin Diet – Is it Good? …it is also easy to gain weight by eating too much processed or refined carbohydrate.” I was under the impression that the Pritikn Diet advocates against the eating of processed or refined carbohydrates. You are right – whole grains, potatoes, beans, vegetables, only. No white bread or donoughts. And if you look at the calorie per pound for whole grains, you’d have to eat a lot of them to gain weight. I’m not saying it can’t happen but for the average person, it probably won’t. The whole carb thing has been overplayed! Yes, REFINED carbs can cause health and possibly weight problems, but eating lots of healthy carbs- fruits and veggies etc. can help most people get healthier and LOSE WEIGHT! The sugars in produce are absorbed by the body more slowly, especially when the fiber found in produce is taken into consideration. This will prevent the problem of insulin imbalance that can occur from too much fat or refined carbs. The Pritikin Diet can be successful and health-promoting, but the main problem is NOT the carbs, it’s that too many people don’t have the discipline it takes to cut fat percentages that low. It’s doable, but tough, especially in our culture that promotes eating unhealthy food such as junky snacks and high fat and sugar laden foods!